Adventure Tours Key Largo: Welcome to Keys Skis Watersports! There’s nothing quite like the thrill of sitting down on a jet ski, revving the engine, and taking off across the deep blue waters off Key Largo. The sun, the surf, the sea — what could be better? But we here at Keys Skis Watersports understand that jet skis and waverunners aren’t the only adrenaline-inducing activities to be experienced here in Key Largo. If you’re looking to get out over the ocean without having to drive your own personal watercraft, our parasailing tours might be right up your alley. Or, if you prefer your adventure closer to the water’s surface to get up close and personal with the water and inquisitive sealife, then check out our kayak tours and kayak rentals for an intimate connection with inland waterways and the wide open Atlantic and the Gulf of Mexico. But if you’re looking for a dryer approach to seeing all that Key Largo has to offer, our bike rentals give you the chance to explore the shores without dipping into the water. Curious about more details regarding our adventure tours and rental options? Keep reading to learn more. Jet skis may very well be the most popular sea excursion options we’ve come across. With speed, turn-on-a-dime control, and room for two, jet skis allow us to get off the shore and into the water while getting our blood pumping. For your convenience, we offer both 15- and 30-minute rentals, as well as one- and two-hour jet ski rental services, giving you the best options for exploring the canals, Atlantic, and Gulf waters. With the Atlantic, Gulf of Mexico, inland waterways, and John Pennekamp State Park all conveniently located and accessible, kayak rental is an excellent way to see the shores that border our beaches. Renting a kayak for either one or two people gives you the chance to explore our shores at your own pace. Take in the natural splendor of the keys when you rent a kayak from Keys Skis Watersports. No other ocean adventure tours can give you the views and thrills that parasailing exudes. Flying 800 feet above Key Largo’s waters, you (and your one or two fellow flyers) will be treated to 25-mile views of Key Largo, the Atlantic Ocean, and the Gulf of Mexico. And don’t worry about sudden storms or choppy waters putting a damper on your daredevil fly time; we monitor weather in real time, ensuring a safe (and exhilarating!) parasailing experience. Renting a bike to explore Key Largo is one of the most convenient ways to zip between shops, restaurants, and shores, giving you an active and fun-filled way to see our beautiful community. Cap off your day on the water with a leisurely bike ride wherever you find the trails and roads leading you. 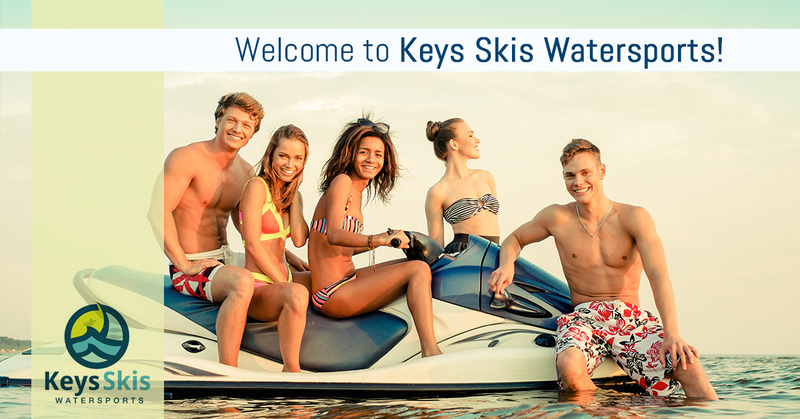 Whether you choose to rent a jet ski, kayak, take a parasailing tour, or opt for taking a dryer path with our bike rental services, Keys Skis Watersports has everything you need to make your next vacation in the Keys one that’s unforgettable. If you have any questions, comments, or concerns, don’t hesitate to get in touch with us.